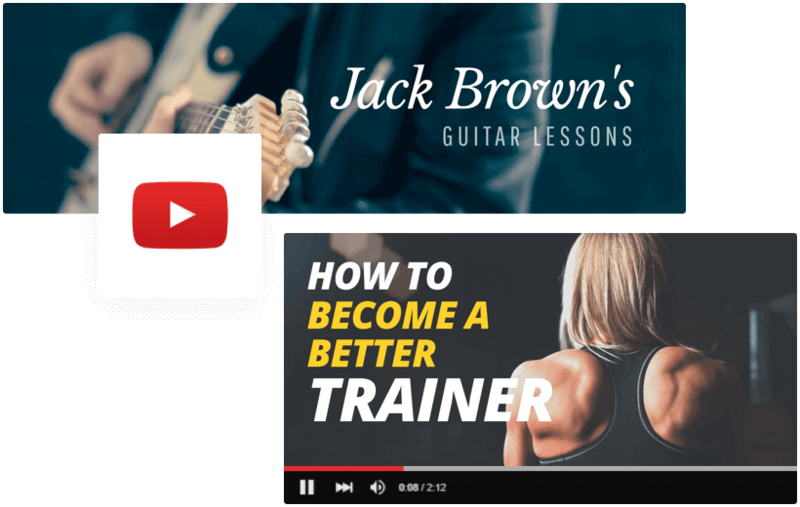 Level up your YouTube channel with some amazing channel art and video thumbnails. Use our banner maker to create background wallpapers that will bring more life to your channel, and video thumbnails that are guaranteed to draw attention. Create new visuals for your channel that will impress everyone! You don’t have to create your banner design from scratch. Just start from one of our ready-made templates! Create the perfect YouTube cover for your channel without any design skills. Have you ever dreamed about an easy-to-use, intuitive photo editing software to create your YouTube channel art? Bannersnack might be just what you need! Hundreds of free stock photos, shapes, and text presets are waiting for you! Be consistent across all social media platforms! Now you can use Bannersnack to create great looking visuals for all your social accounts: everything from headers and channel art to banners for advertising. Increase the click-through rate of your YouTube videos with a well-crafted video thumbnail. Turn screenshots into click bait. Make your brand stand out on Twitter with a great looking cover. Design your own Twitter banner or start from one of our templates. Turn your average photos into works of art worthy of being displayed on Instagram, or create banner ads for your campaigns. Easily create banner ads for your Facebook campaigns. Test different ideas and see what your target audience responds to. Show off your personality with the perfect timeline cover. We have lots of examples to inspire you. Start your own design now. Create amazing looking covers for your Facebook event pages and enjoy watching the number of participants grow. Our app features hundreds of templates and presets to help you focus on what matters the most: your creativity! The drag-and-drop photo editor is really user-friendly and fun to experiment with. Fully flexible: you can upload your own fonts, images, and even the .svg files you need to create your personalized YouTube cover photo. Pay attention to YouTube’s special sizing requirements and focus all your main elements in the middle of your channel art. The safe area that's guaranteed to be visible on any device has only 1546 X 423 px. With our templates, none of the important elements from your cover will be left out. Don't clutter too many elements. Use clean, simple designs enhanced by high-resolution images. It's never been easier to get more followers with a well-designed Youtube cover photo! Just follow the step-by-step guide we provided for you and watch your Youtube channel art come to life with amazing visuals! The YouTube channel art size is 2560 x 1440 pixels, but in Bannersnack, all you have to do is choose the YouTube channel cover option and you'll be sure to get the perfect size. Don't know where to start? We've got you covered! Check out our amazing collection of YouTube banner templates, or get inspired and create your channel cover from scratch. If you've just started a YouTube channel, you already know how important creativity is! Have fun combining personalized images and shapes to amaze your followers. You're just a few clicks away from having the best YouTube Channel cover out there! Just save your design and export it as a .jpg or .png file, then upload it to your channel. Our online banner creator is designed to make the creation of new visuals as smooth and as fast as possible. It’s a great tool for both marketers and designers and we have a lot of free resources to help you out. Get started today and discover our templates, stock images, shapes and clip arts.